E-Com LLC, a Midlothian-based engineering consulting firm, filed suit last month against C.A. 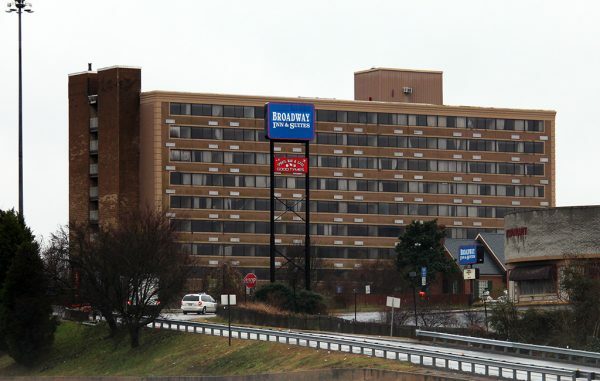 Harrison Cos. and other parties involved in the planned redevelopment of the former Ramada Inn along Interstate 95, alleging it is owed the bulk of a $450,000 contract for interior demolition and asbestos remediation. The suit, filed March 20 in Petersburg Circuit Court, seeks a judgment of more than $1 million, further alleging that company principal Chris Harrison and others conspired in a scheme to defraud state agencies that awarded the project grant funds and to damage E-Com’s reputation while benefiting from its work. Chris Harrison at the project’s unveiling in 2015. The dispute adds to other legal fights surrounding the project, including a breach-of-contract action E-Com brought in January against another Harrison company, Virginia Hotel Development Group (VHDG), as well as a contractual dispute from Commonwealth Architects, a Shockoe Slip-based firm that initially filed suit against Harrison two years ago. The architecture firm, which claims it is owed upwards of $150,000 for services related to the project, filed a revised version of its complaint in January in Richmond Circuit Court. The complaint is largely the same as the suit filed in 2017, but with updated details about the contract in dispute, said attorney S. Sadiq Gill with Durrette, Arkema, Gerson & Gill. Gill, who is representing both Commonwealth and E-Com in their disputes against C.A. Harrison Cos., described the reasons for the refiling as “legal minutiae” but said the overall dispute and award sought is unchanged. The previous case was non-suited last fall. Gill is not representing E-Com in its contract dispute with VHDG, as that case is required to go through mediation and arbitration in accordance with that contract. Jesse Gordon of Pender & Coward is E-Com’s attorney in that case. In his response to Commonwealth’s initial suit in 2017, Harrison contended a services proposal between the parties was not a valid and enforceable contract, and that Commonwealth did not properly bill for its services. The developer further alleged the services spelled out in Commonwealth’s lawsuit were not completed and that the firm is not owed any money. The lawsuits add to an already slow-going project, which was announced in 2015 but didn’t start site work in earnest until last year, after Harrison closed on the city-owned hotel property at 380 E. Washington St., paying $750,000, according to an announcement. Online property records still list Petersburg as the owner of the 2.3-acre parcel, which the latest city assessment valued at $1.18 million. 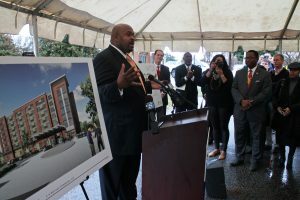 Harrison has attributed the delay to city administration changes, finalizing financing and, to a lesser extent, the dispute with E-Com, which led to liens being placed on the property last year. Gill’s suit states Harrison since has hired another contractor, North Carolina-based Clear Site Industrial, to finish the asbestos remediation E-Com started. The suit alleges that Harrison defamed E-Com and its work in an effort to put E-Com out of business and avoid payment. It also alleges that Harrison and other parties, including N.C.-based GTM Holdings LLC and principal Hess Hempstead, presented documents and invoices misrepresenting E-Com’s work while securing municipal and state grant funding for the project. The project has received $350,000 from the Virginia Brownfields Restoration and Economic Redevelopment Assistance Fund, and $600,000 through the state’s Industrial Revitalization Fund. Estimated to cost about $20 million, it would involve turning the nine-story hotel into a 125-room Cambria Hotel & Suites brand, and converting surrounding buildings included with the property into a mixed-use development with 100 apartments and more than 20,000 square feet of retail space. Harrison is represented in the E-Com case by Richmond attorney Godfrey Pinn of Harrell & Chambliss. Pinn described the case as a payment dispute and expressed confusion over other allegations made in the suit. 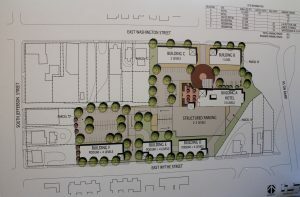 Plans called for two office and retail buildings north of the hotel and three four-story apartment buildings to the south. “These are simple payment disputes, with respect to E-Com, that we are in the process of trying to resolve through the adjudicative process,” Pinn said, adding that the parties’ agreement includes an alternative dispute resolution that is in process. Pinn said liens put on the property have since been bonded off, and said the project is proceeding notwithstanding the pending litigation. 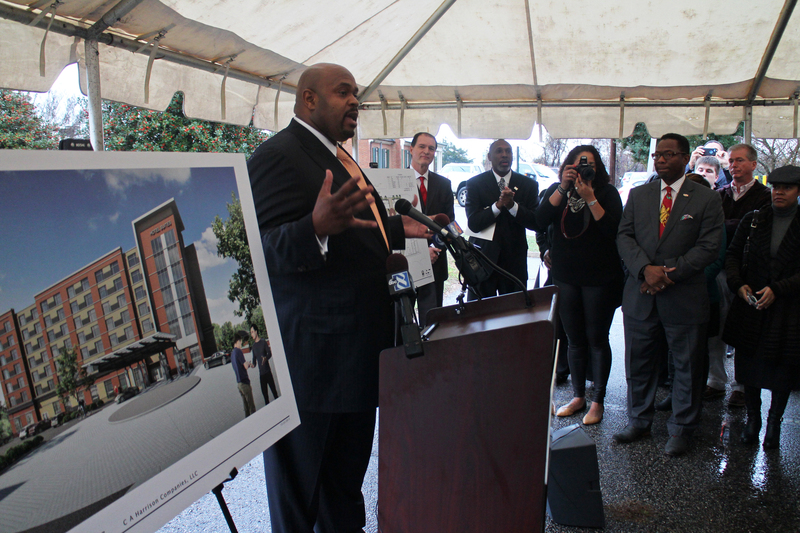 Harrison has said the development would require an 18- to 24-month schedule after closing. Formal responses to the more recent suits from Commonwealth and E-Com had not been filed as of Monday. 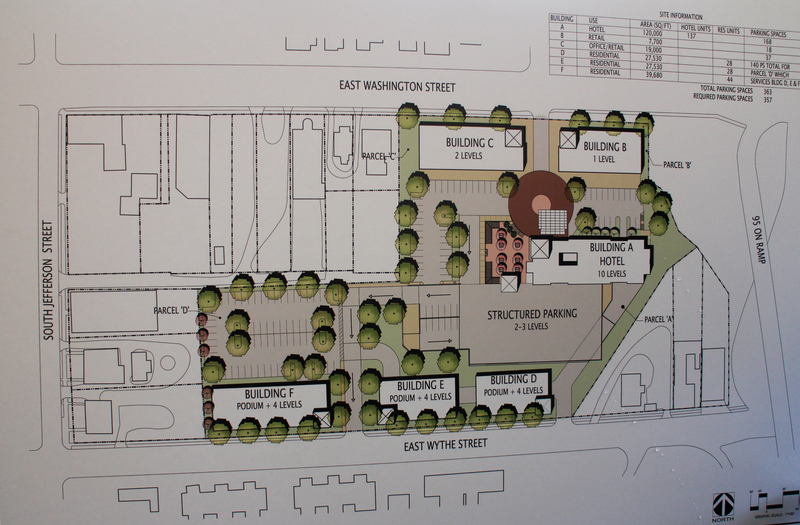 Harrison’s other projects in the region include the Argon Apartments building on Cutshaw Avenue in Richmond. His C.A. Harrison Cos. also is under contract to purchase the Model Tobacco building along Jefferson Davis Highway, with plans to convert the Art Deco-style structure into 275 apartments. 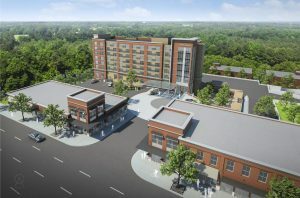 2 Comments on "Petersburg hotel project hit with more lawsuits"
It is proceeding? I have not seen anyone on site in months doing anything significant. And Petersburg is slow but not that slow in processing deed transfers. Does he really own the structure? Also is the surrounding area safe? Is the asbestos abatement over ? Is this a public health issue?